ALISO VIEJO, Calif. (July 24, 2013) – The SIMA Humanitarian Fund’s annual campaign, Stokes Me, returns for its second year this September. This year Stokes Me takes fundraising to a new level with surf industry brands and retailersjoining forces, more fun in the wave pool at Surf Expo and new faces on the Humanitarian Fund Board. In a departure from last year’s fundraising competition, Stokes Me will use retail participation to raise money this year.Select retail locations will ask customers to add a dollar to their order throughout the month of Septemberandsurf industry brands will add to those donations with pledges of up to $7,500. The participating retailer list stretches across the country and includes Hi Tech, Jack’s, Noll Surfboards, Surfside Sports, Maui Nix, Spyder, Surfride, Coastal Edge and Brave New World, among others. Surfer Magazine, Surfing Magazine, and Surfline.com have all donated media space in order to drive customers into the participating stores. With these marquee surf industry doors and industry brands participating, the campaign is poised for success. Stokes Me will kick-off with the Stokes Me Surf Contest on Saturday, September 7, at the Surf Expo Industry Party presented by Sanuk. Participants will throw down in the wave pool in a contest that’s anything but average. Brands and retailers will be on hand to see which antics stoke them, all in the name of fun and charity. To participate, brands can choose to be a Super Stoked donor, a Stoked donor, or pledge a ‘la carte. The Super Stoked $7,500 pledge includes brand recognition on promotional material and four guaranteed spots in the Stokes Me Surf Contest. 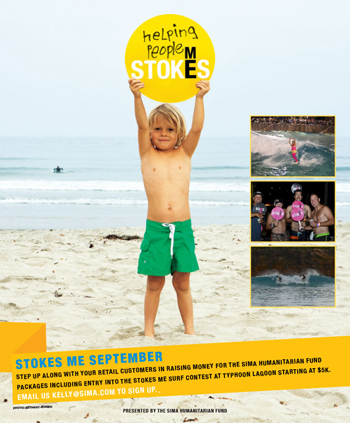 The Stoked pledge of $5,000 includes brand recognition on the Stokes Me social media and website and two spots in the Stokes Me Surf Contest if available (based on a first-come, first-served basis). Brands pledging a ‘la carte can choose to donate from $1,000 - $5,000 with a donation of $1,500 or more receiving two spots in the Stokes Me Surf Contest if available. These donations are all tax-deductible. Among the changes for 2013, three new board members are also lending their wit and work to the effort. Dylan Slater from Rip Curl, Courtney Kincade from O’Neill, and Chris Wagaman from Salt Life and the Noll Project have joined the board. Does this stoke you? For more information about Stokes Me and how to get involved visit www.stokesme.org or contact SIMA Event Specialist, Kelly Keenan, at 949-366-1164 ext. 3. The Surf Industry Manufacturers Association (SIMA) is the official working trade association of more than 300 surf industry suppliers. Founded in 1989, SIMA is a non-profit organization that serves to promote awareness of the surf industry and participation in the sport of surfing through public relations efforts and a variety of services, educational programs and research. In addition, SIMA actively supports oceanic environmental efforts through its 501(c)(3) charitable environmental foundation, the SIMA Environmental Fund. In the past 23 years, SIMA's Environmental Fund has raised more than $6.2 million for environmental groups seeking to protect the world's oceans, beaches and waves. The SIMA Humanitarian Fund, also a 501(c)(3) charitable foundation, was established in 2006 to award grants to various surf or boardsport related social and humanitarian non-profit organizations whose efforts are focused on improving the quality of life, health and/or welfare of people.